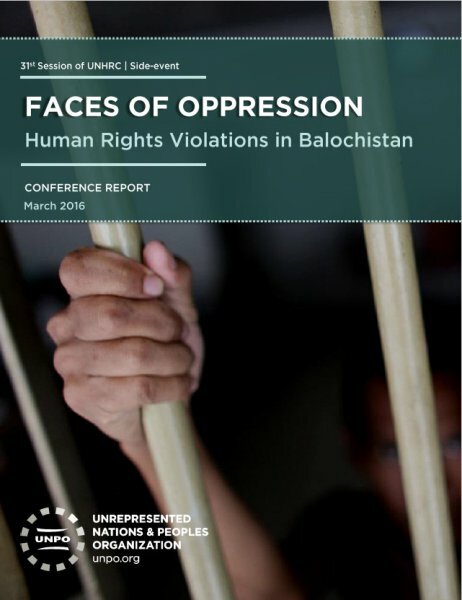 Against the background of the release of the UN Working Group on Enforced and Involuntary Disappearances’ (WGEID) annual report, the Unrepresented Nations and Peoples Organization (UNPO) is releasing a report titled “Faces of Oppression: Human Rights Violations in Balochistan” following a side event hosted on the occasion of the 31st Session of the UN Human Rights Council in March 2016. The report contains the transcripts of all opening remarks and speeches delivered at the event, as well as the speakers’ biographies. The report contains transcripts of the speeches given at the side event, namely of the opening remarks by Mr Merhan Baluch (Baloch representative to the United Nations), by human rights campaigner Mr Noordin Mengal and UNPO Programme Coordinator Mr Fernando Burgés, as well as transcripts of the instructive expert contributions by Mr Burzine Waghmar (Senior Teaching Fellow at the School of Oriental and African Studies, SOAS) and Mr T Kumar (Amnesty International USA). In what amounts to a ‘disappearance campaign’, agents of the Pakistani state systematically abduct, ill-treat, torture and kill Baloch dissidents and human rights defenders without having to fear any legal repercussions. Due to a brutally enforced media blackout, national and international media coverage of these heinous human rights violations is virtually non-existent. Meanwhile, the Balochs’ plight is going (deliberately) unnoticed by Western partners who rely on Pakistan in their global War on Terror and is thus largely left unaddressed in international fora. Against this background, this side event was important in that it raised much-needed awareness for the plight of the Baloch population of Pakistan and enabled information sharing and wide and open discussion on this critical topic among supporters of the Baloch cause. Given the attendance of more than a hundred participants, there seems to be genuine concern for the plight of the Baloch among representatives of the media, civil society, academia and diplomatic missions.